McMenamins is a Washington and Oregon chain of unique hotels, brew pubs and other venues housed in renovated historic buildings. Appointed with lively themed décor and artwork, the various McMenamins locations serve great food and brews (my favorite is the Terminator Stout!). Urban Sketchers Seattle’s ad hoc Friday group has sketched a couple times at McMenamins’ 6 Arms Pub on Capitol Hill. This morning USk Seattle met at McMenamins newest location that opened last fall in the Anderson School property in Bothell. In addition to a hotel, this McMenamins also includes a movie theater and several food and beverage venues on the grounds of the former Bothell Junior High, built in 1931. Although cold, it wasn’t yet raining when we arrived, so many sketchers got a sketch or two outdoors. 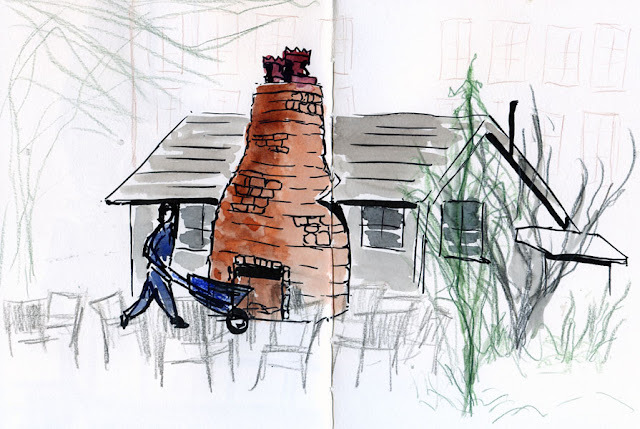 Bundled up in my down jacket, scarf and fingerless gloves, I wasn’t too uncomfortable as I sketched the tiny Shed, which looks no bigger than an actual shed, except it’s apparently large enough to go inside and sit with an ale. When my feet started to get numb, I ducked into the Tavern on the Square, the largest food venue on the premises, to warm up. 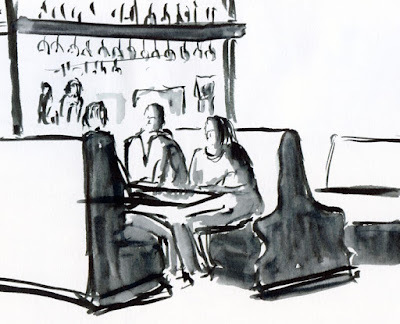 Joining a number of other sketchers scattered about the toasty fireplace and lounge area, I made a small sketch of a booth next to the bar. A glass of Terminator was tempting, but I had to drive myself home, so I settled for coffee. I wanted to go back outside to take a few photos, but by then it started pouring, and a harsh wind came up, too. We all agreed that McMenamins Anderson School is worth revisiting, especially when the weather warms up.